Any pre made items will ship right away. Any custom items or made to order items will ship after Christmas at this point. Carry and protect your cigars in style. 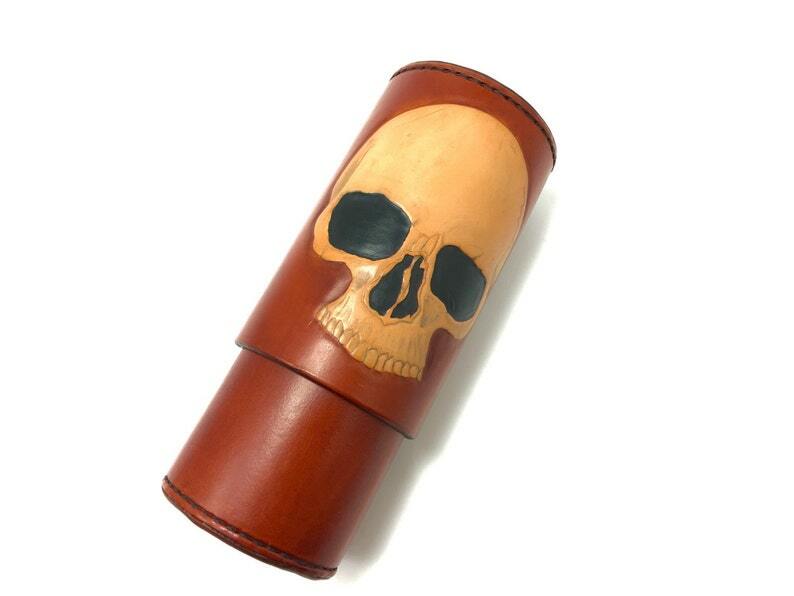 This is a made to order leather telescoping cigar case. It features a hand drawn skull tooled in the upper half of the case. The CigarTube will be very similar to this, but not 100% what is pictured. What is pictured is a very close example. This will hold up to 8+ cigars depending on size. 8 Churchill sized cigars or 7 robusto sized cigars. The upper and lower half are lined in with Spanish Cedar. The upper half is half lined as to provide a stopping point for the CigarTube. This case offers higher capacity and more rigidity and protection than many others. I use hand cut 9/10oz thoroughbred leather vegetable tanned leather, and it's meticulously hand sewn together. It is hand dyed and finished with eco friendly finishes. Please allow at least 2 weeks for order to be complete and shipped. I have my iPhone with the Etsy app on my hip at all times and will notify you as soon as things are complete. please note all cigars in the photos are for display purposes and are NOT included. Custom Cedar Lined Leather Cigar Case With Cutter Pouch. Handmade in the U.S.A.